Jewish Organization Needs an Engaging New Logo! We have a logo that is outdated and does not portray the congregation as modern and continually evolving to meet the needs of our community. Our background gives an accurate message of our beginnings, but not of who we are becoming. Showcasing ourselves as how we want to be perceived is a goal of this logo re-design. If that message could be described in language like this, how does it translate into a graphic look? 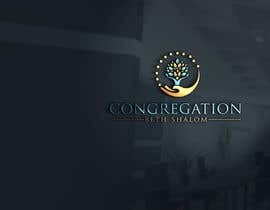 •	CBS offers a home where you can live your Judaism in a contemporary world, drawing on our ancient teachings and traditions. We do this with present-day understanding to create a dynamic and diverse community, welcoming you and your involvement. •	Intended Use: We plan to use the new logo on the CBS website, social media accounts and outlets, on letterhead, and other purposes such as public communications, advertising, sponsorships, etc. •	Size: The selected design will be scalable for high resolution use in various contexts, such as website banner, website footer, letterhead, etc. It therefore should use “vector graphics” to accommodate scaling for various purposes. •	File/Format: Design must be submitted in a computer file format that is easily portable. Final product will need to be submitted in JPEG, EPS, and PNG formats. •	Color: The design should be in color, but should also be useable in black and white, and reverse color. We are requesting that shades of bright greens and blues be included. •	Items to note: Including the use of Hebrew is desirable (words can be provided based upon theme created), Transparent background when possible. The logos which are rated high are very generic and not so good for Jewish Synagogue. You have rejected good logos. It is pity that logos with Jewish symbols are rejected. Some designer's logos were very good including mine. You rejected the logos which had Jewish touch. It is so unfortunate. Thank you for all of these great entries! We are most drawn to the artwork that includes some sort of an icon: trees, people, hands, flames, lights, doves, etc.